Back in the day, I was one of those line dancin’ waitresses at the Texas Roadhouse in Ashwaubenon, and that’s where I met Aaron Rodgers. I was working there in 2005, and now and then Packers players would come in to eat during training camp. One time, Aaron Rodgers and a few of his buddies just happened to be at one of my tables. This was when A-Rod was just a clean-shaven, baby-faced rookie, and Brett Favre was still the love of Lambeau. The one thing I remember very well about good ol’ Rodgers, was how immaturely he acted. He even threw peanuts at me and threatened he could get me fired when I threw them back! That got a great big “OOOH!” from the rest of the table. What if that was Aaron’s attempt at flirting with me? Darn. Too bad I was engaged! Although I thought Rodgers was just a punk back then, he sure turned into quite a respectable young man (not to mention a Super Bowl MVP). He can even grow hair on his face! When all that Brett Favre drama went down, Rodgers took it upon himself to ease the tension by sporting a ridiculous looking mustache during the pre-season. That started a funky facial hair tradition, which has been picked up by other teammates over the years. 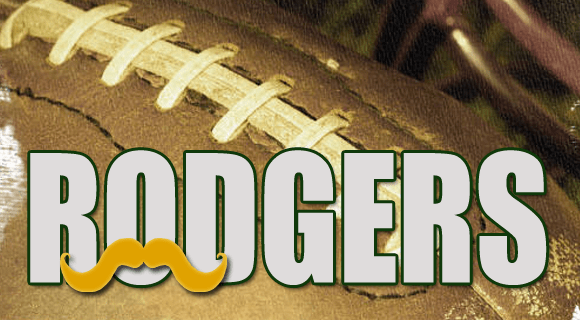 Do you have a favorite type of beard or mustache on Aaron Rodgers? Do you prefer a clean-shaven look? Have any new ideas for another style he should try out? This year he seems to be going with the Simple Scruff. Perhaps his girlfriend and rumored fiance, Destiny Newton, isn’t a fan of all those whiskers. Leave us a comment and tell us what you think. Plus don’t forget to LIKE WHOONEW ON FACEBOOK so you don’t miss all the other fun stuff we’ll be putting together! I’m a fan of the full beard or Grizzled Pro – as you called it. The others are good for showing off, but nothing beats a classic beard. I like the mutton chops because they say, “I am serious about my facial hair.” That takes dedication, man. Well… maybe just a littler ; ) ha!